Mmmm, brownies. These are so good. Sure they have may needed to stay in the oven for an extra five minutes, but they are delicious when gooey and warm. 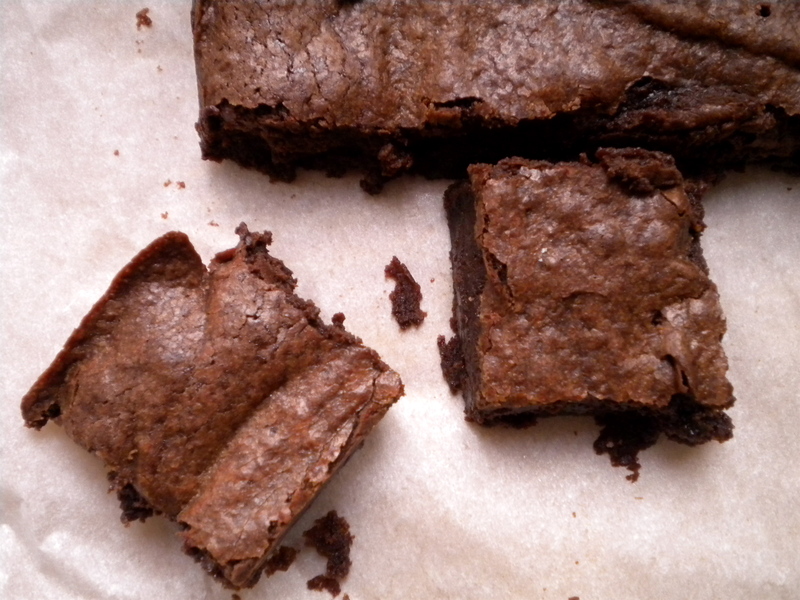 Plus, the next day (after being stored at room temperature in a ziploc bag) they were totally fine and really fudgy. The impetus for these brownies came after making a batch of black bean brownies which, let’s be honest, did not turn out that great. In an effort to redeem my brownie reputation, I made these and we were oh so happy that I did. Preheat oven to 325. Line 8×8 inch baking dish with parchment paper. 1. Combine the butter, sugar, cocoa, and salt in a medium heatproof bowl and set the bowl in a small sauce pan of barely simmering water. Stir from time to time until the butter is melted and the mixture is smooth. Remove the bowl from the skillet and set aside briefly until the mixture is only warm, not hot. 2. Stir in the vanilla with a wooden spoon. 3. Add the eggs one at a time, stirring vigorously after each one until fully mixed. When the batter looks thick, shiny, and well blended, add the flour and stir until you cannot see it any longer. Spread evenly in the lined pan. 4. Bake until a toothpick comes out slightly moist with batter, 20 to 30 minutes. Let sit a few minutes before diving in. O I love black bean brownies! What went wrong? I think it was a combination of too much ground espresso and not blending the beans well enough. what recipe do you have? i’d love to try them again! I have been making brownies myself. I think they always taste better the next day–partly because I try to eat them as soon as they come out of the oven and burn my tongue.